ShoutWiki offers a set of different skins for your wiki. The default skin is called Aurora and has been designed exclusively for ShoutWiki. Nevertheless, ShoutWiki offers different skins to choose from. Here are the main available skins below. Aurora is a ShoutWiki-exclusive skin offering built-in support for sharing on social networks, two sidebars, a built-in Universal Coordinated Time (UTC) clock and an extraordinarily large logo space. It's currently our default skin. Cologne Blue was a popular skin before the days of Monobook skin. It does not feature a space for a logo image and its sidebar is static when compared to Monobook's editable one. Monaco is a skin that is quite popular among users and communities for its many different features, such as the collapsible navigation portlet. It has a larger space for a logo than Monobook and a sidebar with expanding lists on. Monobook was the default style of Wikipedia from 2004 to 2010 and most other MediaWiki sites before being succeeded by Vector. It is very easy to customize and thus it's no wonder that many wikis chose to keep Monobook as their default skin. 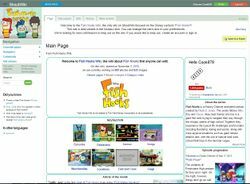 To many users, Monobook is a familiar, comfortable and simplistic skin which enhances their wiki-experiences. Nimbus is a rarely seen skin, best known for its use on Halopedia. It features a Monaco-esque sidebar and a unique footer which is enhanced when using social tools. Truglass is a stylish skin which provides a sleek corporate look. There is no logo space and the sidebar is on the right hand side. Vector is the latest MediaWiki skin and is currently the default skin of Wikipedia. It was introduced with MediaWiki 1.16. Vector is a very popular skin and many prefer it over Monobook. The search bar, unlike most other skins, is along the top of the page. Registered users can define their personal CSS stylesheet rules by editing User:<username>/<skinname>.css, replacing <username> with the user's username and <skinname> with the skin's name. For example, if your username is John Doe and your skin is Monobook, your personal stylesheet would be located at User:John Doe/monobook.css. To change your skin on a wiki you can go to Special:Preferences and choose the skin you want in the appearance tab. To change the skin for all visitors to your wiki, contact the Customer Support Team.